In World War I films were closely scrutinized by military censors. This happened to American cameramen who went to Europe to film the Great War, but it also happened to the official cinematographers of the U.S. Signal Corps who were assigned to cover the war after the United States had entered the First World War in 1917. Lt. Edwin F. Weigle and Carl Akeley, inspecting new type of film camera (December 1917). Photo from the collection of the National Archives, Washington, D.C.
We recently came across a production file in the National Archives on a film that was shot in June 1918 by Lieutenant Edwin F. Weigle at Fort Sill, Oklahoma. Shortly after Weigle had finished this report he went to Europe and filmed with the 35th Division in France. Weigle's war films have been described in more detail in our book American Cinematographers in the Great War. He was the "star" cameraman of the Chicago Tribune and filmed with the Belgian and German army in 1914-1916. 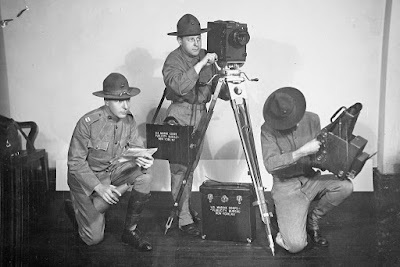 When America came into the war Weigle was one of the first cameramen to join the U.S. Signal Corps. The documents on Weigle's film report present us with some interesting information on how his movies were cut by the censors. Weigle had gone to Fort Sill on an assignment to film various scenes at the School of Artillery Fire. Apart from the handling of different types of guns, he filmed a night barrage with Browning machine guns, soldiers throwing hand grenades into barbed wire and the operation of trench mortars. The footage was shot for episode 62 of the series Pictorial History of the War of 1917 which was produced as an historical record for the General Staff. Although these films were not taken for publicity purposes there was no exception to the rule that all footage had to be censored at the War College in Washington, D.C. Both the film titles that were submitted by Weigle as well as the actual film scenes were all checked. Weigle had filmed French 37 mm artillery guns and these scenes were all deleted, presumably because these would show the Americans were dependant at the time on foreign military equipment. Any information that could be of interest to the enemy was also cut out of his films, such as a scene showing a comparison between the smallest and the largest gun in the U.S. Army and an intertitle mentioning how much time it would take to train an artillery officer. Considering the fact that these films were made as an historical record it makes you wonder what the military censors did to the official war films that were shown in the American theaters at the time for promotional purposes. In 1936 Weigle's footage was edited into a Signal Corps compilation film on World War I field artillery training. Unfortunately, as a result of this compilation, Weigle's original scenes showing machine gun operations and the exercises with trench mortars and hand grenades were not used and seem to have disappeared. But his film on different types of artillery in action has survived. Here is a download link to the complete production file on Weigle's 1918 film project. We have uploaded parts of this film with scenes shot by Weigle on our YouTube channel. The British Universities Film & Video Council has launced "News on Screen", an impressive online resource for the study of newsreels and cinemagazines. As a result, we found 47 records of scenes shot by American cinematographer Ariel Varges between 1916 and 1919, which makes it possible for the first time to do a close analysis of his film work during World War I.
Varges was one of the first newsreel cameramen in American film history. A celebrated war photographer, he worked for William Randolph Hearst and filmed with the Serbian and the British forces between 1915 and 1919. His work has been described in more detail in our book American Cinematographers in the Great War. Until recently, we had only found one World War I newsreel shot by Varges in the collection of the Library of Congress. These scenes were shown in Hearst-Selig News Pictorial No. 71 and were exhibited in the American theaters on September 6, 1915. Varges' film shows Serbian soldiers guarding the forts at Semandria. After the fall of Belgrade in October 1915, Ariel Varges followed the Serbian army during the harsh winter march into the Balkans. He ended up in Salonika (now Thessaloniki) in the north of Greece, where the Entente forces were opening a second front against the Central Powers. Varges was by all accounts the only official cameraman who covered the activities of the Expeditionary Army around Salonika, Greece, in 1916. Because of this special interest his films were used extensively by the British War Office for publicity purposes and released through the Topical Film Company. A total of 29 contemporary war scenes credited to Varges and shot in this area have now been identified, all with a release date from March 1916 for the newsreel Topical Budget that was shown in the British theaters twice a week. Based on these online records we were also able to identify 7 newsreel scenes from the film collection of the Imperial War Museum as having been taken by Varges at this frontline sector. [SUBTITLE]: "German aircraft[s] flying from the Bulgarian lines, drop bombs on the Allies base at Salonika but are brought down by our airmen." French soldiers guarding captured German reconnaissance plane, with Greek civilians looking on. The plane is carried and pushed away. Varges later also covered a Zeppelin attack on the city, as well as the damage as a result of this bombardment. Actual frontline footage appears to have been rare in his film reports. Varges mostly captured transport of military supplies to the trenches, artillery engagements, scenes of Red Cross work, refugees from the Balkans finding a safe place around Salonika and prisoners of war taken from the firing line. The records show that he was fond of recording picturesque subjects. 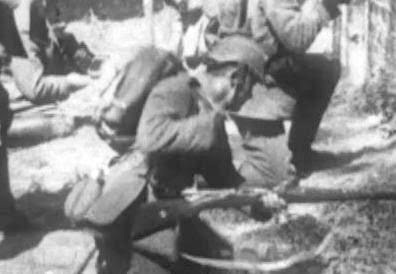 The Serbs he filmed while taking mass before going into battle. When they were withdrawn from the lines, he had them dance a victory performance in front of his movie camera. "The Armies of the Allies"
The international coalition against the Central Powers that was formed at Salonika was another important theme in Varges' film reports. 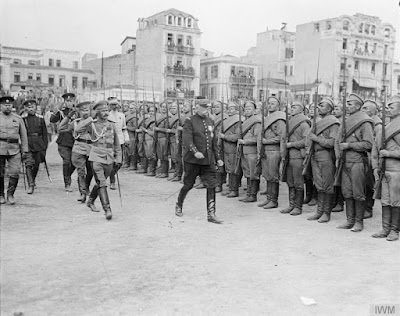 For the British newsreels he filmed how British officers reorganized the Serbian army, how Russian troops arrived in the harbor to reinforce the Expeditionary Army, and how soldiers from Australia and New Zealand were fighting the Bulgars in the trenches around Salonika. [SUBTITLE]: "An interesting group of the nationalities fighting the Central Powers in the Balkans. British, French, Russian, Italian, Serbian, Indian, Cretan, Senegalese, Greek, and Anammite [sic] type of soldiers." Awkwardly posed group (in a V-shape) of soldiers posed for the camera, each a representative of the various races fighting for the Allies in the Balkans. An officer hands out cigarettes to them and they all light one another’s cigarettes. They march in a line past the camera. 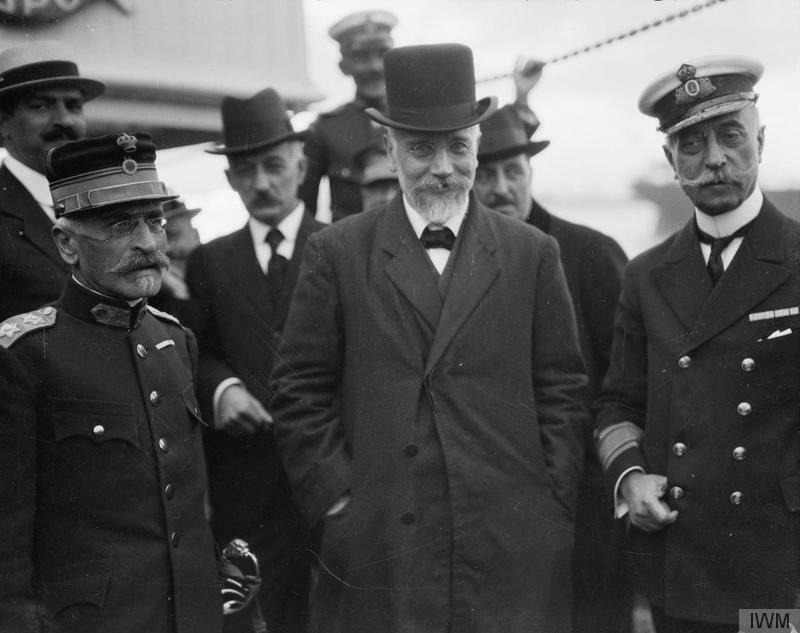 [SUBTITLE]: "His Majesty the King of Greece visits a hospital ship." March past of Greek sailors. View down as King and officers come on board up steps from lighter. Varges' final contribution on the war at the Salonika front appeared in Topical Budget No. 292-2, released on March 3, 1917, with scenes showing an artillery duel in Serbia. By then, he had joined the British forces to another theater of war: Mesopotamia (Iraq/North-East Syria). We will return to this episode in his work as a war photographer in another upcoming weblog. The scenes shot by Varges around Salonika that we could retrieve at the Imperial War Museum have been uploaded on our YouTube channel. 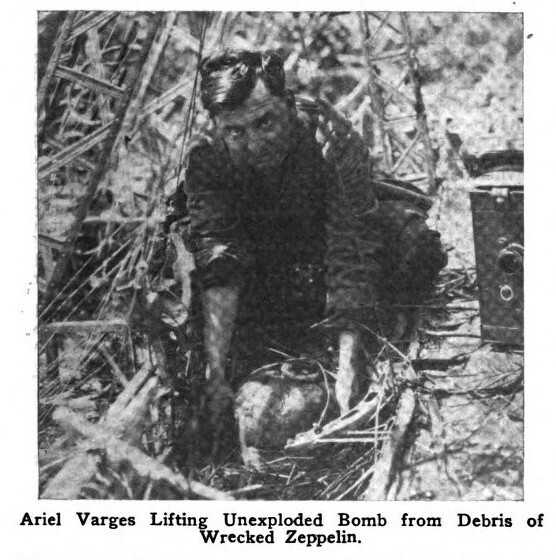 Click this link for a complete list of all references to Ariel Varges and his films for the British during World War I. Now Available - "First to Film: Leon H. Caverly and the U.S. Marine Corps"
As previewed in this weblog, the Historical Journal of Film, Radio & Television recently published an article on Leon H. Caverly, the first cinematographer who accompanied the American Expeditionary Force to France in 1917 to film the Great War. The article by authors Cooper C. Graham and Ron van Dopperen has been published online on the website of Taylor & Francis. The story will be available in print next year. On June 14, 1917, the Fifth Regiment of the U.S Marine Corps left New York. True to their reputation the Marines were in the first wave of American soldiers sailing to Europe. On board was official cameraman Leon H. Caverly. With the centennial of America's entry into World War I, Caverly's pictures take on a new significance. Months before the U.S. Government set up a policy on how to deal with pictures covering the war the Marines had already sent Caverly to Europe. 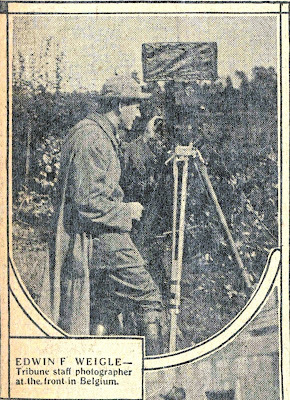 He was by all accounts the first official cinematographer to film the Great War with the American forces. The story is also significant because it is so well documented. We were extremely fortunate in having found Caverly's personal papers. Reading his letters from the frontline it becomes clear what sort of challenges a cameraman had to face to film the Great War. Apart from his own account much of Caverly's work has survived. At the New Jersey Historical Society the authors located about 500 World War I pictures taken by Caverly. The History Division of the U.S. Marine Corps also kindly shared with us a collection of Caverly's photographs. In addition the authors were able to locate and identify much of his war films. All of this makes it possible to reconstruct Caverly's extraordinary experiences as a war cameraman in remarkable detail. While researching Caverly we compiled numerous pictures that he took during his military service in France. A selection of these photographs is available for download here. In the National Archives at Washington, D.C., we also located Caverly's films taken with the Marines and the 2nd Division. Caverly's films have a remarkable wide scope and cover the period from the arrival of the first American soldiers in France until the occupation of Germany in 1919. Caverly's films are listed in this Appendix that accompanies our article. Taylor & Francis offers 50 free ePrints of the article, available by clicking on this link. Also, here is a selection of footage from the National Archives with Caverly's World War I films that we uploaded on our YouTube channel. The Chicago Tribune's On Belgian Battlefields is ranked as one of the most popular films on the Great War that was shown to the American people in 1914. 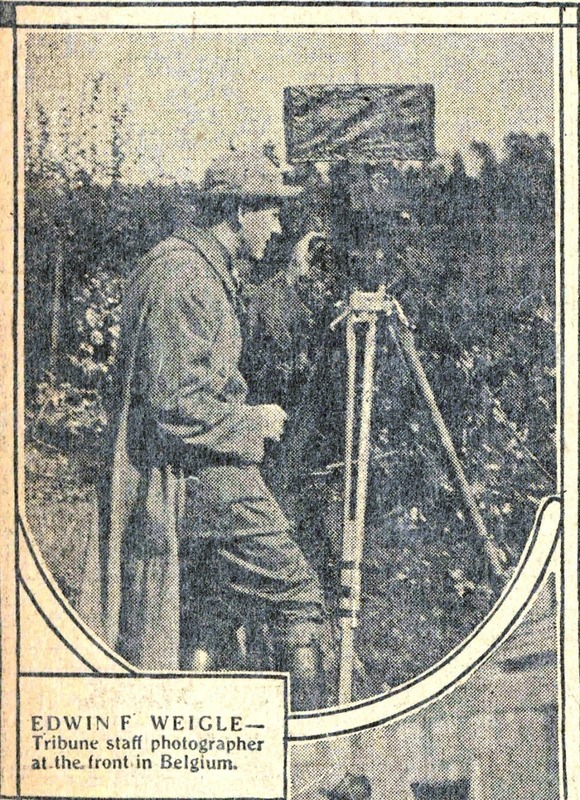 Now sadly lost, the movie featured cameraman Edwin F. Weigle's report on the German attack on Belgium. Thanks to painstaking research by local historian Walter De Swaef from the Belgian city of Alost (Aalst) a scene from this historical film has been located and identified. Edwin Weigle's film adventures in World War I have been described in more detail in our book American Cinematographers in the Great War. Weigle was the Tribune's star cameraman who had just before the outbreak of the Great War filmed the U.S. Marines attack on Vera Cruz, Mexico. After the outbreak of war he filmed in Belgium, Germany as well as on the Western and the Eastern front. 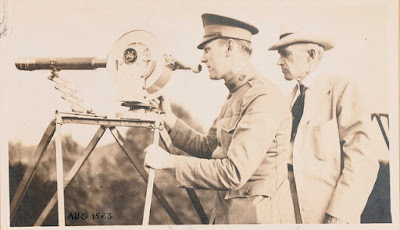 When the United States entered the First World War Weigle was among the first officers to set up a photographic division for the U.S. Signal Corps which had been assigned to cover the American involvement in World War I. City of Alost in flames, photographed by Weigle. From the New York Times, 25 October 1914. High res image (7Mb) available for download here. 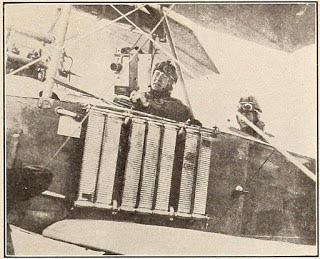 Walter explains: "In your book American Cinematographers in the Great War I first read about Weigle, and that's how I found a reference to his book on his experiences in Belgium. Somewhat later I saw the movie fragment showing the burning of Alost and having checked out Weigle's book on page 44 I noticed his photograph with the caption "The burning of Alost showing destroyed R.R.Bridge". This picture was published in our book on Alost during World War I, Duitse Oorlogsgruwel in Aalst. Then it occurred to me I had seen this scene before on film but with the wrong intertitle "Bombardment of Ghent". The fragment from his movie is most remarkable. You will notice the black smoke above the houses in the center of the picture. Behind these houses was a factory that produced chemical agricultural stuff. In the morning of September 27, 1914, the German artillery bombarded this part of Alost. The complete factory and the houses around all burned down. Weigle must have taken his pictures there in the afternoon of September 27, around 2 P.M. when the Germans stopped bombarding the city for a couple of hours. I suppose that Weigle at this time also was able to enter the city and take some photographs and films of the damage. In order to do this he must have climbed on the damaged railroad bridge. Considering the dangerous situation he was in Weigle's visit to Alost seems to have been short." Weigle evidently did not take any unnecessary risks while shooting these war scenes. As he admitted in his own book, either prior to his visit to Alost or the following night he was forced to spend the night in a barn outside of the city. These pages from his book My Experiences on the Belgian Battlefields, including the photograph mentioned by Walter De Swaef, have more information on Weigle's visit to Alost in September 1914. Walter De Swaef found Weigle's report in two different film collections. The movie scene appears to have been edited into a compilation film produced during World War I, which is now in the stock collection of Periscope Films. An extended version of Weigle's film scene was found in the collection of the Royal Belgian Film Archive. This version has tinted film and was restored in 2002. We have uploaded all of these scenes on our YouTube channel. In addition, according to Walter De Swaef, Weigle's still picture of this scene appears to have been reprinted in 1915 in the German military magazine Landsturm. Also, here is link to a previous post on another film showing the city of Alost during the Great War, that Walter was able to identify, shot by American cinematographer Arthur Radclyffe Dugmore. Great job, Walter, and keep up the good work!